This frame was affordable. 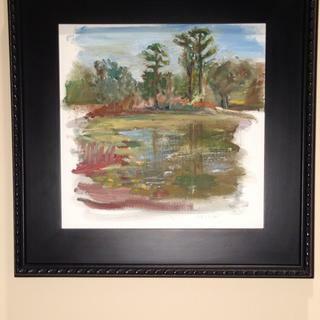 My 24x30 painting looks great in the simple yet elegant frame. Striking, beautifully crafted black frame that sets of my painting. I like the textured edge that compliments my painting's brush strokes. If you're looking for a striking black frame, this is it. Even better than it looks online. Excellent quality, unique and beautiful, looks handmade and is shipped very quickly. Beautiful, soft black finish. I wanted a frame with an inner edge of metallic for the best effect. This frame doesn't have it but it was the most cost effective option available. Wood mat enhances artwork. Not the ordinary frame found at frame shops. Only negative is the canvas clips that come with it don't stay secure; horizontal nails work better. Needed a dark frame to make my sunflowers stand out! Pricing was reasonable as well. Correct size and color for the painting. Fits in with other frames for gallery display. Price. Beautiful frame. Great simple detail around edges. Used in a piano room and added just the right detail. I really like plain air frames. On sale. Simple and let the oil painting be the focal point. It's understated and yet still has character. My canvas is 12 and 1/8 by 16 and 1/8 by 3/4 inch. Will this frames accommodate it? Unfortunately, this frame only comes in standard sizes. 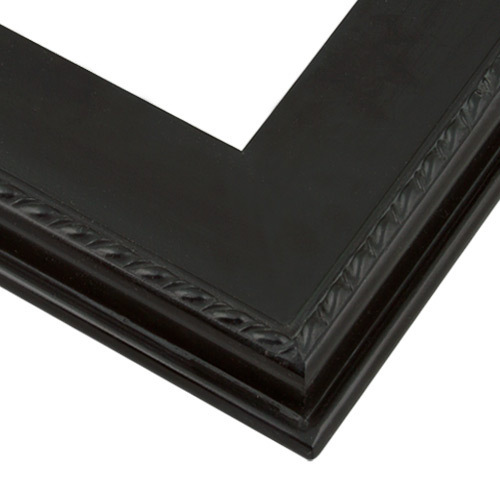 Your frame size is unique so you would need to be looking at a custom frame where you can input your artwork size to 1/8 of an inch. I recommend taking a look at PL9. PL9 is a similar custom plein air frame. If you have any additional question do not hesitate to contact our friendly framing experts at 1-800-332-8884. I have no idea if it will fit. Can you use spacers with this frame? BEST ANSWER: Hello! Yes, indeed. You may use spacers with this frame. The depth/rabbet of the frame is 3/4". Our spacers come in size 1/8" or 1/4". Thank you for the inquiry! I need a stand up frame like this. Do you have a suggestion for 5X7? I have a family photograph 20" x 30" - I dont see that size listed. What do you suggest? BEST ANSWER: Hello. Thank you for your inquiry. This lovely frame is a Ready-Made Frame available in selected sizes. Please consider one of our Custom frames for your project. I have attached a beautiful frame below as a suggestion. Happy framing! Is this frame right for putting in standard sized stretched canvas 24 x 30 approx 3/4 in depth ? BEST ANSWER: Hello Amanda! Thank you for your inquiry. This beautiful frame is available in size 24"x30" and is perfect for your 3/4" Canvas. If you need further assistance, please let us know. We can be reached at 1-800-332-8884. Happy Framing!